Under a dun-coloured overcast sky of late afternoon, the various boats shift and relax, reflecting the diffused glow of a low sun. A raised horizon, high on the picture plane, focuses the attention on the wide, peaceful stretch of calm water: all effort and hurry is over, as the harbour quietens into twilight. The smudged colours of the landscape and warm reds & creams are reminiscent of the Bloomsbury painters; the drawing of the boats, however, is crisp, sharp and economical. The surface of the sea is articulated with graphic dashes and lines of thin impasto, gathered in finely-observed areas which reveal the three-dimensionality of the water, its shadows and movements. Martin Swan was born in the Isle of Wight, and educated at the New University of Ulster, and University College, Aberystwyth. He studied sciences, philosophy and religion, but in the 1980s, when in his thirties, reverted to his boyhood occupation of drawing and painting. He spent about a decade as a landscape painter, before being seduced by the geometric shapes of and the play light and shadow on sailing boats; he came to specialize in resurrecting the racing boats of the Solent from the second half of the nineteenth and first half of the twentieth centuries. 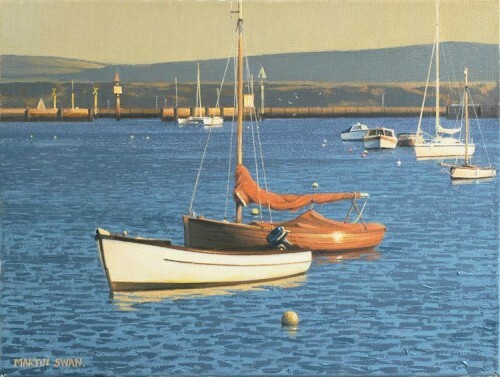 He now paints marines as well as individual boats, and has also returned to landscape painting. He has exhibited with the Royal Society of Marine Artists since 2000, being elected Associate Member in 2003 and Full Member in 2005. His first solo exhibition was held in the Isle of Wight in 2010.